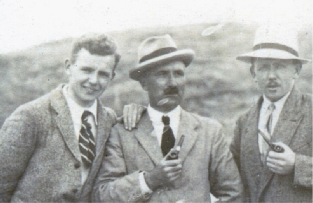 The Exhibition, held on St Davids Day in the Memorial Hall, was designed to showcase some of the work of the photographers who captured a moment in time across North Pembrokeshire, when communication by postcard was developing into a media. For the masses it was affordable and cheap and you could say “Arrived safely. Weather wonderful” or simply “Please deliver a yard of muslin”! This proved a very popular choice of exhibition topic as people are fascinated by how things used to be. This is especially true for local people who not only remember how things were at the time the images were taken … someone actually appeared in the image (‘Andy Pandy’’s Mum – holding him by the hand in the Carnival Parade! The year he was ‘Rupert Bear’ it rained and the check drawn on his smudged)! What was most noticeable was the lack of cars anywhere – and there were recollection of having a bucket and spade by the back-door and the youngest in the household having to rush out whenever the horses had gone by to collect the ‘manure’ for the garden. Then we had the recollection of the young lad (born in the house opposite the City Baker, High Street) playing in the street and collecting sticks to float in the stream flowing down the stone-lined gutters. To reach the front-door of the shops and houses you had a stone slab to get across the gutter. Most of the archive images the Historical Society has collected were originally from postcards, as few individuals would have possessed a camera, so it fell to those who did to record often the local history and social history of the time. One remarkable postcard, of Whitesands, shows the location of St Patrick’s Chapel – its outline clearly visible even though the ruin had disappeared by the 16th century. The reason for this remarkable image? The archaeologists had only completed their excavations of the site a short time before and what was visible was the exposed wall of the chapel, surrounded by the material excavated from the interior. The earliest ‘postcard’ was a painted design by Theodore Hook – which he posted to himself (in 1840) with a Penny Black stamp whilst the first recognisable picture postcards began to appear in the 1880s. By 1894 the Royal Mail allowed the manufacturers of postcards that could be sent through the post. Many early photographers produced images that they retailed commercially and these used the postcard format … so they appear as postcards. Amongst the most popular were postcards depicting stars of stage (and later screen) whilst there was a whole industry producing the ‘postcards’ which most definitely were not intended for the postal service – the so-called French Postcards (‘tasteful’ nudes so favoured by a certain type of Edwardian gentlemen!) A whole new industry developed in the 1930s with the cartoon-style Saucy Postcard but St Davids seems to have missed out on that trend. Most of the local postcard manufacturers focussed on the scenic picture postcard which families could collect as mementos of the holidays and 1910 shows ‘The Fancy Respository’ “Specialities in Pictorial Postcards” on Cross Square. Amongst the large commercial companies featuring postcards of St Davids, Valentines (1907) used a large number of artists including Louis Wain and Mabel Lucie Attwell); Raphael Tuck & Sons (the world's largest postcard publisher, spanning the entire globe, offering a unique visual history of life from 1866); Francis Frith (one of the first to establish himself as a retailer of scenic photographs on a large scale 1860s), Judges (established 1903) and even GWR (producing postcards of destinations along their railways)! It was in 1899 that the UK adopted the standard postcard size of 5.5 inches x 3.5 inches – with a picture on one side and space for the address on the reverse. Writing was often squeezed in the margin of the picture as it was not until 1902 that the ‘Divided Back’ postcard was introduced where the text and address were side-by-side. Postcards of St Davids over the decades feature a number of local producers including: Albert David; Chapman; W U Evans; DG Hampson; WM & J Mendus; Twr-y-felin and Watts Evans. 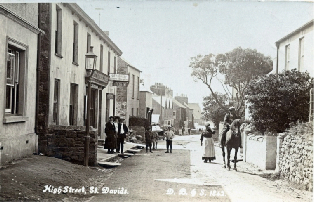 Born in Laugharne in 1853 Albert David set up his own practice in St Davids as Chemist and Druggist on Cross Square but like so many other chemists photography was one of his passions and he produced some of the earliest photographs of St Davids. W Morris and John Mendus later took over the chemists business … and took over the photography and postcards - with William Morris Mendus providing the photographs for a book on St Davids Cathedral, as well as many of the well-known images of St Davids, dating to the 1950s-60s. Fishguard boasted 4 postcard producers: Chas Evans, W Eynon, Studio Jon and Vince. One of the most remarkable images if Fishguard Bay has to date to the days when the fishing fleet in the bay. 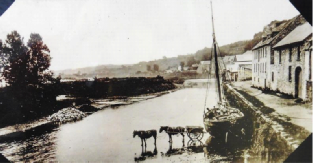 Lower Fishguard developed as a herring fishery and port, trading with Ireland, Liverpool and Bristol. In the late 18th century it had 50 coasting vessels and exported oats and salt herring. 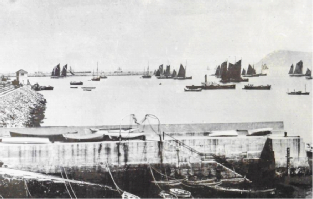 The port declined in the 19th century so amazing images of the fleet in the harbour are long-gone. 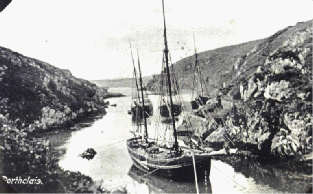 Even Solva had its own postcard manufacturer at one point – CM Rees. Similarly striking are postcards showing Haverford west – which had its own postcard manufacturers D Bowen and SG Griffiths, in addition to postcards from the larger manufacturers. 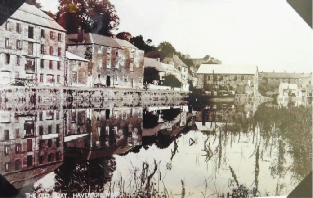 Even at the start of the 20th century Haverford west still had boats on the river, docking alongside the warehouses and off-loading their cargoes onto horse-drawn carts … on the riverbed when the tide was out! The St Davids & Dewisland Historical Society is extremely indebted to John T Davies for all his help in compiling this exhibition and to Paul Edey for his presentation of the Exhibition.